The review package process lets you send Flare files for review, as well as receive file contributions from, SMEs and other Flare authors. 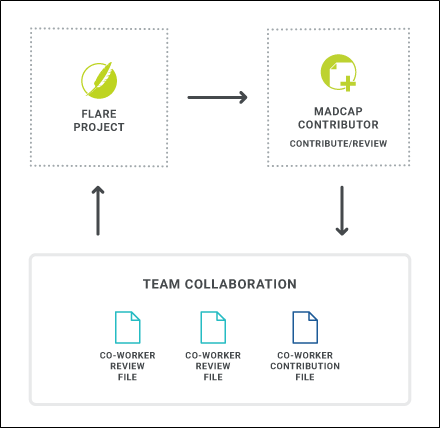 Non-Flare users can download a separate application called MadCap Contributor when collaborating with you and your Flare project. You can also use the same features to send files for review to other Flare authors using Flare only. PDF or Word You can generate output for the relevant files in PDF or Word format, then send that output to your reviewers. After the reviewers return the document, you can manually incoporate the feedback into the source file(s). If you have tracked changes in Flare, you can preserve the changes so they are visible when you generate PDF or Word output. This is enabled on the Advanced tab of PDF and Word targets. See Preserving Tracked Changes in PDF or Word Output. Reviews—Sending to Others You can email review package files containing topics and/or snippets to other individuals for their feedback and/or changes. Alternatively, you can use SharePoint integration or the external resources feature to store the review package files. The reviewer's changes are always automatically tracked so you can see what edits were made. After inserting annotations (comments) or making changes to a file with Flare or with Contributor (for non-Flare users), reviewers can send the package back to you. You can then view those comments and accept or reject the edits so that they are added to the source file(s). Contributor has two modes—registered and free. Registered users can add annotations (comments) to your files, as well as edit them (with changes tracked). Users of the free mode cannot edit documents; they can insert annotations only. 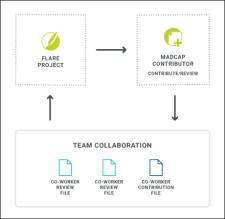 See Review Workflow—Sending to Others. Reviews—Receiving from Others Using Flare, you can review documents sent to you by other Flare authors via email or other methods. See Review Workflow—Receiving from Others. Contributions Authors, developers, or other individuals in your company can use Contributor to create new documents and files, which can be incorporated into your Flare project. These documents can also be exported to PDF output. See Contribution Workflow. Following are some of the key features available for topic reviews and contributions. Annotations You and other individuals can insert comments and notes next to content in a topic. Annotations do not become part of the actual content; they are simply comments for your internal use. See Inserting Annotations. Contribution Templates In order to accommodate and assist the contribution process, you can create contribution templates for other individuals to use. These templates are topic files that can be crafted to already have certain pieces in place (e.g., text, formatting, locked regions) and make certain ancillary files available (e.g., variables, condition tags, stylesheets) to the contributor. After using the template to create a new document in Contributor, the contributor can send it to you, and you can then make the document part of your project. See Creating and Sending Contribution Templates and Sending Contribution Templates. Emailing Thanks to tight integration with Microsoft Outlook, topics can quickly be emailed back and forth for review. The necessary file is automatically attached to the email, and the default email message text is provided. You can also save email messages to use again in the future, and you can add email addresses to an address book for enhancing quick file transfers. See Sending Files for Review in Contributor or Flare, Creating and Sending Contribution Templates, and Sending Contribution Templates. Note: This works with 32-bit versions of Microsoft Office, not 64 bit. SharePoint and External Resources When you share review and contribution files with others, you can use SharePoint integration or the external resource files feature as an alternative to sending the files through emails. See About SharePoint Integration and About External Resources. Locks This feature is not limited to reviews and contributions, but it comes in quite handy in those processes. You can put a lock on certain parts of a topic or contribution template, which lets individuals see those areas, but not modify them. See Locking Elements. Review Ribbon and Toolbar The Review ribbon and toolbar let you perform many of the tasks involved with reviews, such as sending topics for review, importing review packages, tracking and accepting changes, and inserting annotations. See Ribbons and Global Toolbars. Snippets Not only can you send topics for review, but snippets as well. In addition, if you are sending a topic or snippet for review and that file contains snippets, those snippets are automatically included as part of the review package too. However, you can exclude any of the snippets that you do not want to be part of the package. See About Snippets. Track Changes You can track changes made to content files edited in the XML Editor and accept or reject those alterations individually. Each change is marked in a color (different colors for different users) and/or labeled in a sidebar (see About Track Changes). You can change the way tracked changes are displayed in the interface—e.g., in balloons, inline, change bars (see Changing the Display of Tracked Changes). The tracked changes for each user can be shown in a separate color. You also have the option of choosing a specific color for all users (see Changing the User Color for Reviews). Note: When you send files for review or receive review packages from others, changes made to those files are automatically tracked. User Name and Initials You can modify the user name and initials that are part of annotations and the track changes feature. You can do this from the Review tab in the Options dialog (File > Options). See Changing Your User Name and Initials. Note: You cannot use the Text Editor when working with review packages.